Full touch screen system available upon request. The E-2500 is a large, high powered, floor standing style coil winding machine. The robust frame is fabricated from heavy guage galvanised steel, with machine covers in stainless steel, and it is equipped with a face plate, tailstock with security closure, guider system and foot pedal. 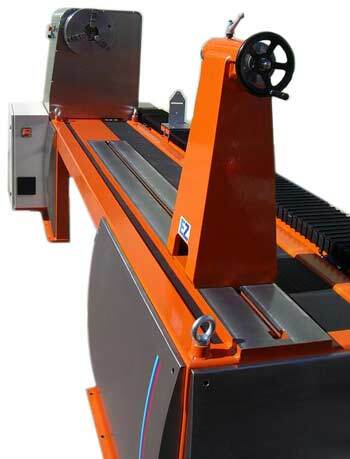 The machine has an advanced CNC control, and complex windings can be quickly set up by means of electronic programming. This coil winding machine is specially designed for the manufacture of large scale inductive devices, typically rotor coils for use in the wind turbine industry, large electric motors and generators, etc. using aluminum or copper wires, (including rectangular or flat wires with a special guider).